Since my studies in Manchester University, where I studied MSC in Maintenance Engineering & Asset Management, I have always been interested by Data and how we tend to use it to further our Maintenance & Reliability processes. My MSc thesis titled: “Data collection and its use to advance maintenance management and maintenance practices to support business objectives” discusses it in great details. So why post a little blog about it? Well, I wanted to get a discussion going about the three main focus areas once you have decided what data to collect. 1. Data collection systems: How can we effectively use them for our benefits? The systems are many and the data is of various natures. There are for example the graphs from our vibration program, the thermal images from our IR program, a lot of statistical data from various systems like ERP, EAM, CMMS, Cost & Profit from accounting data systems… and the list can be quite long. With all of those systems how can we collect all the data and send it to the Data processing systems to be processed effectively and efficiently? 2. Data processing systems: These systems can vary in nature and function. Usually these systems are as many as our techniques to collect data. To effectively process the data it is a key factor to gather the data in a perfectly uniform way. This can be challenging to do and we will need great work processes to be able to get this right. 3. 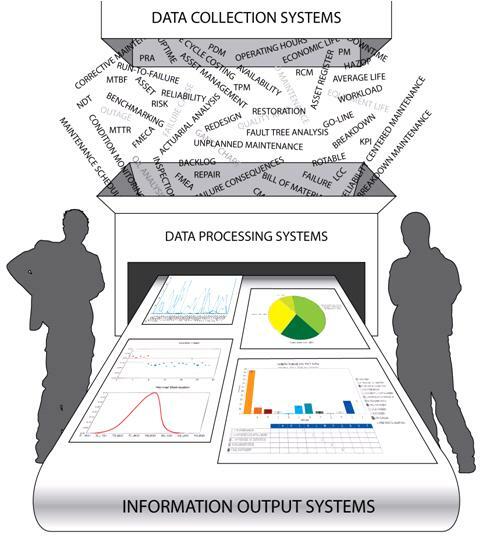 Information output systems: The quality of the results depends greatly first on the quality and amount of the data collected, secondly on the way we process the data and finally on how we interpret the information that comes out of the information output systems. It is crucial for the quality of the decisions made to have the data uniformly collected, processed and put out of the information systems. After these three steps we will need to make decisions that benefit our Maintenance & Reliability process and the positive effect of those decisions will depend greatly on the quality and uniformity of each step in the process. I would appreciate all of your comments and discussions here below, thank you for your time and interest in my Blog. This entry was posted in General posts about Maintenance & Reliability and tagged Computer data processing, Computerized Maintenance Management System, Data, Data collection, Data system, Information systems, Maintenance, Maintenance Management, Manchester University, Reliability, Reliability engineering by Bjarni Ellert Ísleifsson. Bookmark the permalink. Great post. Would be worth while ensuring the data that has been collected is validated BEFORE processing. Processing inaccurate data would be a waste, resulting in low confidence levels of the output presented. So analysis of the history of pump (B) alone may provide innaccurate data and as such data validation is required. I wonder how many companies use ISO 14224 to implement their maintenance software? I at least have not heard of one. For those interested here is a link to an introduction of ISO 14224 ( http://www.google.is/url?sa=t&source=web&cd=2&ved=0CB8QFjAB&url=http%3A%2F%2Freliabilityweb.com%2Fee-assets%2Fmy-uploads%2Fdocs%2F2010%2FISO_14224-2006.pdf&ei=HAcIT6SBOsrH8gO9i721AQ&usg=AFQjCNGMjmFzhvRtIjVCJPpXRZ6ArLQvZA ). It talks about data collection more than software implementation. In my view two different subjects but they are related. What I tell people about ISO 14224 is do not worry about the Maintenance and Reliability Data for Oil and Gas because it works for any company. I have seen it work in over 100 sites and it is a great tool. Is it the best, no, however in the absence of a standard we have chaos. I agree with you that in the absence of standards we have chaos. Also that data collection for Maintenance and Reliability works on the same principles no matter what industry you are in, with maybe minor adjustments in emphasis. However defining the Data Collection for a company implementing a CMMS/EAM system is only the start of the implementation process, you need to know what you need the data for, how you are going to base your decisions on the data collected and what the re-action or hopefully pre-action you are going to take to advance your manufacturing process in a positive way. It is absolutely necessary to arrive at logical conclusions we need to carry out analysis on the basis of VALID DATA. Most of the failures in decision making is can be attributed to incorrect data or perceptional approach. Mistake proofing in data entry in an ERP / CMMS system and training are the possibly only solution to the problem of incorrect data entry. Thank you for your comment Dilip. I would be conservative and say 90% plus of companies have the problems you stated about software for managing maintenance. People ask me all the time which software is the best. My answer is, are you in a reactive maintenance mode or totally proactive? If you are proactive why do you need a new software? I totally agree with you for the most parts, however I am convinced that in a great proactive environment that has no software to manage activities and analyse opportunities would be even greater with a software… also if companies in a reactive mode only focus on the software implementation to get from reactive to proactive mode are really focusing on the wrong issues. Thank you very much for your input Ricky, I really appreciate it. You bring a lot to the world of Reliability & Maintenance and I enjoy reading the material you publish. The best or the effective CMMS tool is the one which could be handled easily by a normal user, the software must use the same familiar naming convention which people are used to. with the help of GUIXT and Personas SAP fields can be labelled the way you want them to. it makes SAP so much easier to use. My experience says that the process should be easier only then people can use it. Complex process is a killer for any CMMS tool. secondly while implementing any CMMS all stake holders should be involved, specially reliability people just to make sure that it effectively captures all the fileds related to RCM analysis. Your comment is valid and makes things easier with personalised fields for entry, however we must be careful that everyone who uses the systems need to be aware of the reasons why we collect information. With personalised fields there is always the risk of different interpretation of why the data is collected and then it has the potential of making the data less reliable. Thank you again for your comments Syed, keep up the great work. I’m glad you are interested in this subject and I did some work on it in my MSc dissertation called : “Data collection and its use to advance maintenance management and maintenance practices to support business objectives”. I worked with both John Harris and Andrew Ball, great people both of them and all the great people and Manchester University. I wish you great fortune in your work. This is an excellent topic. For many decades maintenance engineers have tried to collect data in order to improve reliability while lowering operational and maintenance costs of the assets under their care. Companies continue to invest vast resources in a variety of maintenance information systems. Yet rarely does the stored data contribute to making accurate and optimal decisions. Maintenance engineers can seldom analyze maintenance related databases in order to gain insight with which to improve Predictive Maintenance performance. Although their information systems will generate limitless amounts of information, adding complexity, they do little to achieve reliability from data. Despite this, Maintenance managers and engineers have long believed that within their data lie the secrets for the achievement of optimal decisions. We have worked very hard on how to capture the right maintenance information in the day to day practice given the unlimited amount of data created from the different information system (CMMS, RCM software, CBM , Reliability Analysis software). Many initiatives inside maintenance technology industry have been developed throughout history. The CMMS came to light in the late seventies. This was about the time RCM took final shape in aviation. During the same period a third movement, that we call reliability analysis attempted to migrate from design and fabrication phases in order to penetrate in the maintenance world. Finally we have CBM, the most cost effective way of doing maintenance. Each of these commercial ventures grew as independent streams. In order to optimize the use of each of these important initiatives is necessary to integrate them in a well structure maintenance information strategy. We have created a human oriented process that we call Living RCM to overcome the different obstacles that emerged from this independent streams. CMMS have several impediments to capture the information necessary to perform Reliability Analysis (RA). The main obstacle is that the actual codes inside the CMMS can´t represent instances of failure as complete as we find them inside an RCM context. A failure mode is meaningful only in the context of the FMEA’s corresponding Function, Failure, Failure Mode and Effects. Every failure in service is an opportunity to improve the asset´s reliability because RA is the counting of failures modes life cycles. A second major impediment to RA is that failure mode endings are not well typed in the CMMS as one of Failure, Potential Failure, or Suspension. RA cannot be performed without a sample of failure mode lifetimes whose endings are identified distinctly as either “by failure” or “by suspension”. Decisions CBM decision be optimal, automated and verifiable. 3. Verifiable: our models or the process we are using to make decisions must be verifiable. This approach sounds interesting and likely to generate good results in many cases. This of course also sounds like quite a lot of work filled with many challenges to apply, like most things that are worth doing. Thank you very much for the comment Oscar, keep them coming. Bjarni, Nice blog. In my experience, there is enormous amount of human contribution in any of the three steps mentioned. Although many would claim, but due to complexities involved in each step, the fact is that there is no such software or system that could effectively accomplish all the three steps without human input. From input to collection, then processing, interpretion and mitigation action, you need true reliability professional at each step to achieve reliability performance improvement. In most cases I would agree with you that between data collection and all the way to mitigation action there is always some human input or at least interaction. However there are cases where the process can be greatly automated with all the advance sensor technology and analysis capabilities that we have today. All it takes is investing in these technologies and implement them in the most effective and efficient way across the industries we work in. Yes you are right in terms of using the advanced technologies for data collection and analysis. However to get all this done effectively, you need people at every step with correct skill sets that supports reliability improvement who can close the gaps effectively.